Where are the most expensive homes in Washington state? Could they be luxury water view homes around Seattle and on the islands and beaches between Seattle and the Olympic Peninsula? Have you ever wished you could tour some of the most beautiful and expensive homes in the Northwest? Well now you can. There’s a new service that just went online, and it is LuxuryWaterViewHomes.com. If you’re not in the market for one of the most expensive homes in Washington, you will probably love touring these homes online. The photos are stunning. Of course, you would expect they would be for homes listed in the tens of millions of dollars. If you’re in the market for a luxury water view home on the beaches or on the islands of the Sound, the Strait, or the bays of the northwest, then this site may become your new best friend. It was designed and programmed by a nationally recognized broker and real estate expert who represents buyers from California to New York and from Florida to Alaska, and even buyers from Europe. 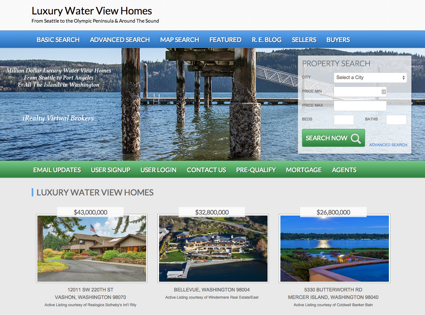 The navigation, the content, the powerful search tools, and the ease of use make this the ultimate buyer’s site for luxury water view homes and the most expensive homes in Washington. Don’t let the simplicity of use fool you. It was built to be both powerful and simple to use. But there is another major benefit for qualified buyers–a buyer’s agent who is one of the country’s foremost buyer’s agents when it comes to negotiating and buyer representation. If you are going to buy a $40,000,000 home, don’t you want your buyer’s agent to be the best? You can learn more at the site, LuxuryWaterViewHomes.com. Enjoy viewing the most expensive homes in Washington.